We've mentioned the Solar Team Eindhoven (STE) before. They were the team which helped to launch the Startupbootcamp HightechXL accelerator programme at an event in June. They mentioned then that the public launch of the world's first solar powered family car would take place on at the Technical University Eindhoven (TU / e) on Thursday, July 4 2013. There was a lot of local and international interest in the unveiling ceremony. There is a lot going on in the South of the Netherlands at the moment. 'Stella' is the first positive energy car with room for four people plus a trunk for luggage. A fully charged battery gives the car a range of 600 kilometers. If you drive less, the solar panels can be used to charge an external battery, hence the term positive energy. You can imagine that these cars of the future would be able to park for free on the rooftops of parking garages, supplying energy rather than consuming it. The team is now focussed on getting this prototype car to Darwin, Australia by October 2013. Once they arrive, they will enter the vehicle in the Cruiser class during the 3000 km World Solar Challenge. They are up against another 9 contenders for the title (including a team from Iran). Congrats to the Engineering team in Eindhoven that made this possible. 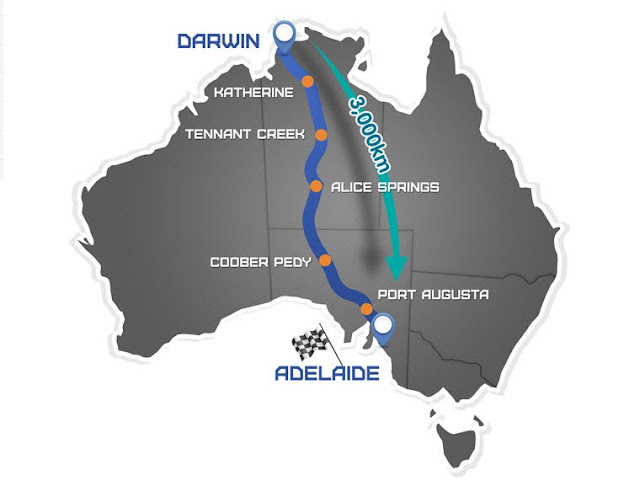 The World Solar Challenge starts in Darwin in the Northern Territory and travels the Stuart Highway to Port Augusta and then via Highway 1 to the finish in the City of Adelaide in South Australia – 3000 kms.